A useful application of calculus is finding maximum or minimum value(s) of a function. 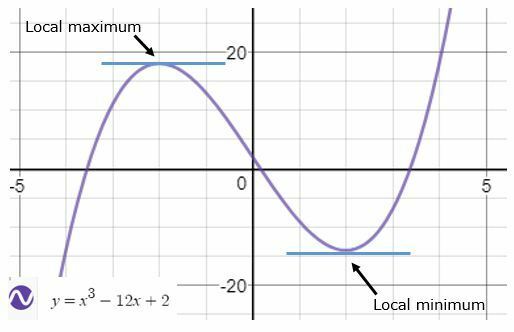 In this graph of the function there is a local maximum (at and local minimum (at ). The blue horizontal line shows that the gradient at these points are zero i.e. How can we tell which solution is the max or min? Take the second derivative (i.e. differentiate to get ). To see this working explained more fully see this Khan Academy video. Khan Academy explains how a study of the gradient on various points of a curve will show places where a relative maximum or minimum exist. Desmos is a free online calculator which can be used to draw graphs to show significant features like local maximum and minimum.